Are you tired of the summer heat yet? Are you ready for some cool fall breezes? Today we will offer a little respite from the heat by showing you some fabulous stamp sets for Autumn and Halloween. All this month, the Design Team will keep you cool with fabulous creations of pumpkins and leaves and spiders and witches and ghosts...oh, my! And as a bonus today, we have a little contest for you. First, let's get to our Spotlight Stamp of the Month: "Every Leaf". The best thing about these leaves is the fact that no raking is involved! Spotlight Stamps are always 35% off with any order, or you can get one free with an order of $60.00 or more (see details here). Want to see all of our featured releases for July? You can find them here. And now for the contest. Each blog on the hop (except the Red Rubber Designs Blog) has one word somewhere in their blog hop post that will help you form a phrase. Once you find all six words (that's a hint!) put them together to form a phrase. You may have to rearrange them a little bit! Note: The word you need from each blog will be obvious if you read carefully.... it looks just a little different from the rest of the letters! Once you figure it out, email the phrase to contest@RedRubberDesigns.com and be sure to put your name and email address in the email with the phrase. 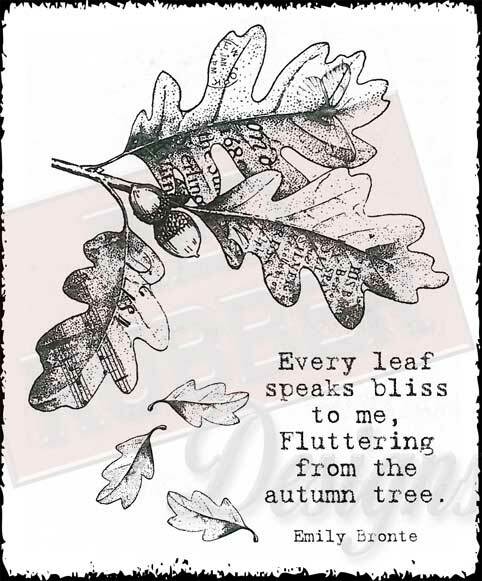 Every correct answer will be entered into a drawing for the featured stamp set - "Every Leaf" - and one winner will be chosen at random. Good luck! Contest ends Sunday, July 8th at Midnight (US-CDT). Love the design and the quote is so beautiful! I absolutely love this stamp!! Thanks for a fantastic hop... I love this stamp, and I'm so pleased (though my bank account won't be!) to have discovered your gorgeous stamp collection. I'm a brand new fan!